Sign Pro is a full service sign and graphics company. In addition to our extensive product line, Sign Pro is committed to providing excellent customer service before, during, and after the sale. "QUALITY SIGNS OF ALL KINDS...ON TIME!" Sign Pro is locally and independently owned and operated by Stephanie Nigh and Betty Baudler Horras. When we started in 1994, we had one vinyl plotter and less than 900 square feet of space. At that time we primarily made vinyl signs. Since then we have added significantly to our equipment by acquiring a Decal Printer, a Wide-Format Inkjet Printer (capable of printing up to 5’ wide in full color), a Wide-Format Vinyl Cutter, a Wide-Format Flatbed UV Printer, and a Wide-Format Laminator. This has greatly increased the amount and type of products we are able to make in-house. Additionally, our employees have over 55 combined years of experience in the sign industry. 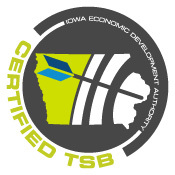 Sign Pro is a State of Iowa Certified Targeted Small Business. We are also proud members of the Ames Home Builders Association, the Ames Economic Development Commission, the Ames Convention and Visitors Bureau, The Main Street Cultural District and the Ames Chamber of Commerce. We want to be your choice for signs and graphics. Stop by our office at 619 S. 4th Street (behind the Lincoln Center HyVee) or give us a call at 515-232-4500. We would welcome the opportunity to show you the Sign Pro difference. Quality signs of all kinds ... on time!